STANLEY -- Fish restoration efforts are again underway in the Yankee Fork basin east of Stanley, the Salmon-Challis National Forest said. This year, work will focus on two projects. The West Fork Confluence Stream Restoration Project, at the confluence of Yankee Fork and West Fork, seeks to restore fish habitat that was impacted by dredge mining and is expected to improve habitat for Chinook salmon, steelhead, cutthroat trout and other fish. Work began in 2015 and will continue through 2017. 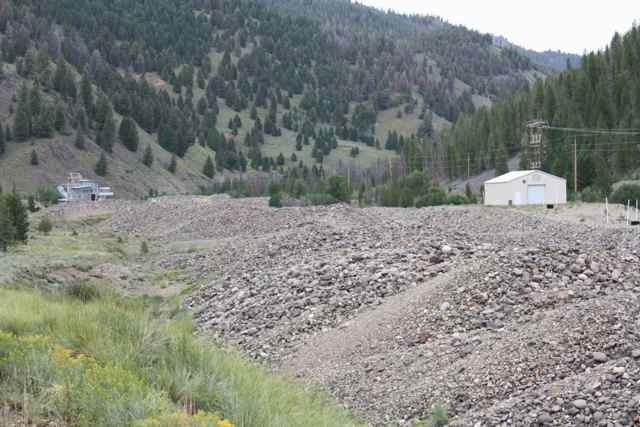 The Pond Series 3 Adaptive Management Project, along the east side of the Yankee Fork Road near Cearley Creek, is also in an area affected by dredge mining. In 2012 and 2013, work restored the area to a more natural condition. "We have been amazed at the large numbers of spawning steelhead and juvenile fish that are using the new habitat created by this project," fish biologist Bart Gamett said in a release. But fish managers want to make some additional improvements, including adding more trees to the stream channel and modifying the channel in two locations to improve habitat conditions. The collaborative effort for both projects includes the Bureau of Reclamation, Shoshone-Bannock Tribes, Trout Unlimited, Bonneville Power Administration, Simplot and Salmon-Challis National Forest. Trucks will operate on Yankee Fork Road between Sunbeam and Bonanza; use caution while traveling this section. The public is prohibited from entering either project area during implementation. The West Fork project has required the closure of two areas on national forest lands just east of the project. The areas are near Preachers Cove and are between Yankee Fork Road and the Yankee Fork. They are being used as staging sites for large trees that will be used in the project. They will reopen no later than Sept. 1. The Pond Series 3 project will result in some short traffic delays on Yankee Fork Road while helicopters work -- generally less than 15 minutes.